[199 Pages Report] The overall wearable technology market is expected to grow from USD 15.74 billion in 2015 to USD 51.60 billion by 2022, at a CAGR of 15.51% from 2016 to 2022. The emergence of wearable technology is expected to transform the outlook of computing on-the-go. Application areas for wearable technology range from consumer durables and healthcare to enterprise, industrial, and so on. As the technology matures, it is expected to find new application verticals and increased applications in existing ones such as the wearable technology used in medical surgery. The base year considered for the study is 2015, and the forecast is for the period between 2016 and 2022. The Internet of Things (IoT) refers to the phenomenon in which not only computers, but all sorts of devices with embedded computing capacity are interconnected. These include self-driving cars, drones, smart sensors, connected homes, and wearable devices. For consumers, IoT technologies offer an array of new devices and service options that make lives and jobs easier. This is especially the case with the subset of IoT technologies known as wearables. Also, IoT plays a significant role in a broad range of healthcare applications, from managing chronic diseases to preventing diseases. 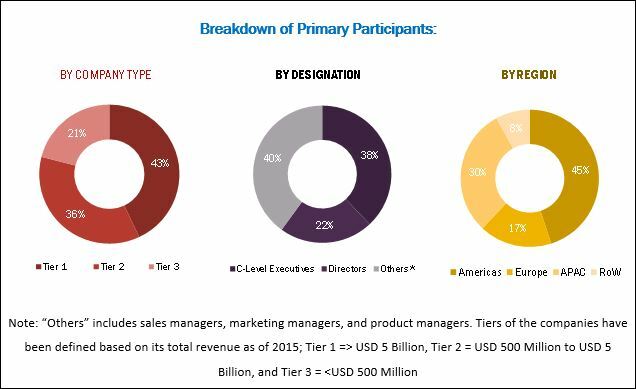 During this research study, major players operating in the wearable technology market in various regions have been identified, and their offerings, regional presence, and distribution channels have been analyzed through in-depth discussions. Top-down and bottom-up approaches have been used to determine the overall market size. Sizes of the other individual markets have been estimated using the percentage splits obtained through secondary sources such as Hoovers, Bloomberg BusinessWeek, and Factiva, along with primary respondents. The entire procedure includes the study of the annual and financial reports of the top market players and extensive interviews with industry experts such as CEOs, VPs, directors, and marketing executives for key insights (both qualitative and quantitative) pertaining to the market. The figure below shows the breakdown of the primaries on the basis of the company type, designation, and region considered during the research study. The wearable technology market ecosystem includes research and development associations, component manufacturers and suppliers, wearables product manufacturers, software solution providers, and end users. The wearable technology market comprises major players, such as Fitbit, Inc. (U.S.), Apple, Inc.(U.S.), Xiaomi Technology Co. Ltd. (China), Garmin Ltd. (U.S.), Samsung Electronics Co., Ltd.(South Korea), Guangdong BBK Electronics Co., Ltd (China), Misfit, Inc. (U.S.), Alphabet, Inc. (U.S.), LG Electronics Inc.(South Korea), Qualcomm Technologies, Inc. (U.S.), Adidas Group (Germany), Sony Corporation (Japan), Jawbone, Inc. (U.S.), and Lifesense Group (The Netherlands) among others. In August 2016, Fitbit launched a new product “Fitbit Charge 2”, a smart band for fitness tracking. This product automatically captures the fitness activity such as steps, distance, heart rate, floors climbed, hourly activity, active minutes, and calories burned. In September 2016, Apple, Inc. launched the Apple Watch Series 2. The product has advanced feature such as water resistance up to 50 meter, built in global positioning system (GPS), bright display, and dual-core process. In December 2016, Samsung Electronics Co., Ltd. entered into a partnership with Lonely Planet (Australia), a largest travel guide book publisher for upgradation of their smartwatch features. With the help of this partnership, Samsung includes a new destination wish list in the newly released watch S3. This feature would attract the travel companies leading to new business opportunities. How the wearable technology disrupts the way healthcare applications are carried out in both clinical and non-clinical applications? What are the new application areas which wearable technology companies are exploring? 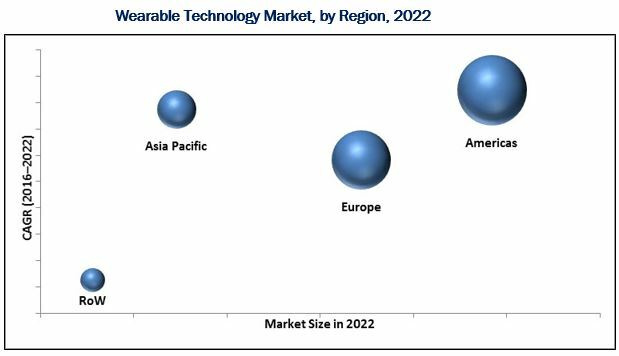 The wearable technology market size is expected to grow from USD 15.74 billion in 2015 to USD 51.60 billion by 2022, at a CAGR of 15.51% between 2016 and 2022. 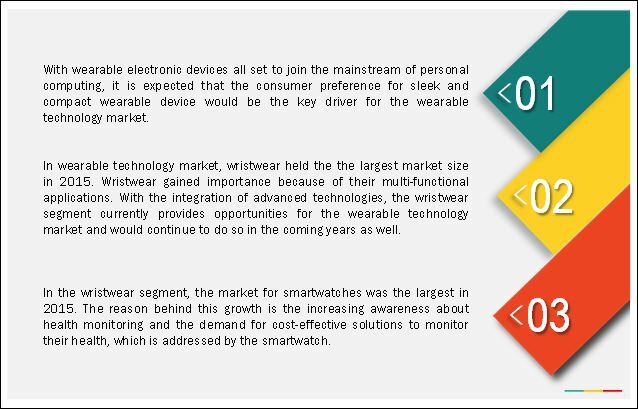 The wearable technology market is expected to grow because of various driving factors, such as consumer preference for sophisticated gadgets, increasing growth prospects of next-generation displays in wearable devices, and growing popularity of Internet of Things (IoT) and connected devices. Wearable devices or products are small electronic devices worn by users which enable mobile computing and wireless networking. The term wearable technology refers to any wearable electronic device or product which helps to integrate computing in daily activities or work. The wearable technology includes headwear & eyewear such as augmented reality (AR), virtual reality (VR), footwear such as athletic, fitness, and sports shoes, wristwear such as smart watches and wristbands, and others (such as body worn camera and ring scanners). The concept of electronic textiles (e-textiles)/smart textiles has recently emerged from the concept of integration of wearable computers in clothing and apparel. The wristwear product segment is expected to cover the maximum size of the wearable technology market between 2016 and 2022. The factor for this growth is attributed to key industry players who are introducing products with advanced features to serve customers’ need of fitness and healthcare. Wristwear measures fitness and healthcare parameters, which includes heartrate, calories, distance travelled, and steps. All such parameters could be synchronized with a mobile to store data. Moreover, people could access the mobile through wearable devices with the help of wristwears. So considering all such developments, it is estimated that wristwear would gain the maximum size of the wearable technology market between 2016 and 2022. In 2015, the Americas accounted for the largest share of the wearable technology market because of several factors. One of the most important factors is technological innovations and advancements, which led to the introduction of new products. The increasing demand from consumers and medical applications has also led to the growth of wearable technology market in the Americas. Increasing health consciousness among people, there is a growing demand for cost-effective and time-efficient fitness solutions, which drives the growth of wearable technology market. Consumer wearable electronics includes a number of wearable devices that are used in varied applications such as fitness and sports, entertainment and multimedia, and garments and fashion. The growth in the market can be attributed to the rising consumer demands coupled with the proliferation and suitability of the enhanced communication protocol and miniaturization of sensor technology. Sensors and wearable devices can be integrated into various accessories such as garments, hats, wristbands, socks, shoes, eyeglasses, and other devices such as wristwatches, headphones, and smartphones because of their compact size and advanced integration technologies. Wearable technology plays a crucial role in remote patient monitoring. It enables continuous monitoring of the patient’s vitals and data collection, thus allowing doctors to look at data over a certain time and understand the patterns of the patient’s overall health. . The wearable device technology offers a supplementary source of information apart from the events narrated by the patient and the symptoms experienced for concluding the diagnosis of the patient. This application of wearable technology is critical when the patient is at a remote location or may not be able to directly provide information to the physician, such as in case of children, the elderly, or those battling mental health issues. Skin patches are small adhesive devices attached to the patient’s body that detect body metrics such as heart rate, respiratory rate, and blood pressure. Such wearable devices act as extensions of a smartphone. They gather data and transmit information wirelessly, thus making a clinician’s work more efficient and extending care outside the hospital environment. Enterprise and industrial wearable devices include compact, mobile, and wireless computing systems that can be worn on the body as well as various image scanners that find applications in enterprise and industrial processes. Wearable computers, in the form of wristwear and fingerwear, are enabling devices in the logistics, packaging, and warehouse applications where they are deployed to increase workers’ mobility and productivity. What could be the potential industrial applications of wearable technology? How wearable technology leverages the cloud and data analytics services to expand applications and increase functionality? The shorter life cycle of the consumer electronics products is the major restraining factor for the growth the wearable technology market. Additionally, the wearable technology market faces some challenges associated with growing concerns such high initial costs and limited battery life, and unaddressed regulatory issues and vulnerability of healthcare information. This report describes the drivers, restraints, opportunities, and challenges pertaining to the wearable technology market. Moreover, the report analyzes the current scenarios and forecasts the market until 2022. Furthermore, this report includes the market segmentation based on type, product, application, and region. Some of the major companies in the wearable technology market, include Fitbit, Inc. (U.S.), Apple, Inc.(U.S.), Xiaomi Technology Co. Ltd. (China), Garmin Ltd. (U.S.), Samsung Electronics Co., Ltd.(South Korea), Guangdong BBK Electronics Co., Ltd (China), Misfit, Inc. (U.S.), Alphabet, Inc. (U.S.), LG Electronics Inc.(South Korea), Qualcomm Technologies, Inc. (U.S.), Adidas Group (Germany), Sony Corporation (Japan), Jawbone, Inc. (U.S.), and Lifesense Group (The Netherlands) among others.